My couch is well, a broken down futon inherited from a friend who got it from a friend and so on. It doesn’t stay in the grooves, so is perpetually sunk in with the bend resting on the floor. When you sit on it your knees can be all the way to your chest (or at least that is how it feels to me anyway). Needless to say it’s okay for sitting cross legged on or on the edge if I’m working on things on my coffee table, but not really just for sitting. My friends avoid it. I don’t blame them. So I need to fix that, or get a new couch, but the latter won’t happen. So the solution? Pillows! 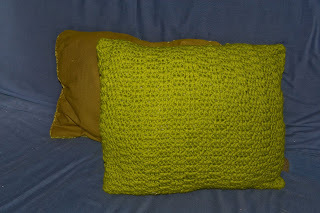 I didn’t have enough of the same yarn to make a full knit/crocheted pillow, so I backed them with a sturdy decor fabric. I needed more than just one, so two it is. One is knit and one is crochet. Okay, i thought everything was great, but it's not downloading the revised pattern. I'm going to have to fix it when i get home or I'll be late to work. I'm having issues again! Hooray! It's fixed (I think it was actually just me and my browser not refreshing from the server or some such thing). 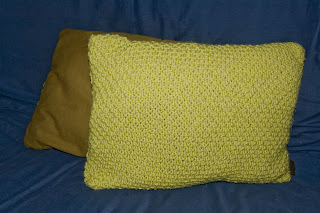 Download the pattern here (pdf). I'm steadily working towards revamping the shop (it's coming, just slowly). As soon as I started school everything kind of spun out of control, but life is yet again regaining order, hooray! Subscriptions will be going out on Monday so you can start checking your mail boxes towards the end of the week (I love getting mail!). On another note on that end, I've decided that I want to change the send out date to the first Monday of the month instead of the second, so the October subscriptions will be going on sale Monday, September 17th for one week, then be sent out Monday, October 1st. I'll send out the time in the mailing list and make an announcement with photos and whatnot closer to the date. (You can sign up for the mailing list by clicking here - link). And thank you so much to the pattern testers who tested this pattern to make sure it was A-okay! We have a loveseat for you it's just a matter of getting it up there to you. It is a floral pattern so you may want to start thinking what you can put over it. Hmmm.... floral aye? I can work with that. Now how to get it up here, that is the big question. Someday! Maybe you and dad should just come visit.